For many of us, houses built between the 1950s and early 1970s have a real sense of nostalgia about them. Perhaps it’s their modest forms, simple lines and clean angles, or their association with timeless mid-century design, but these homes hold a special place in our hearts. 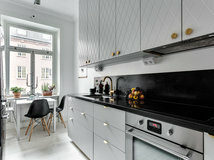 But if your 20th-century abode isn’t quite meeting the needs of your 21st-century household and you’ve decided that a renovation is on the cards, you needn’t worry about losing your home’s original charm. 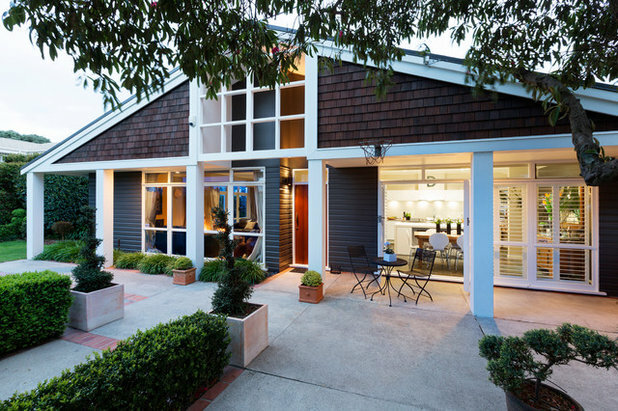 Instead, be inspired by these seven makeovers where the experts have managed to bring the properties up to date while maintaining their mid-century magic. 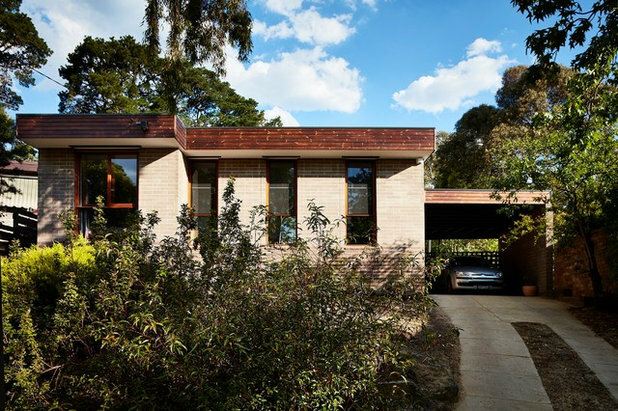 This mid-century house in Newtown, Melbourne, strikes a balance between old and new. “The owners had an emotional connection to the existing house and were keen to retain its spirit,” says architect Anne Hindley of Hindley & Co. 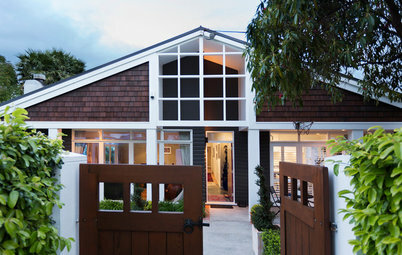 The renovation retained the double-sided glass entry and existing fireplace, while adding more living spaces and continuing the original roof line. 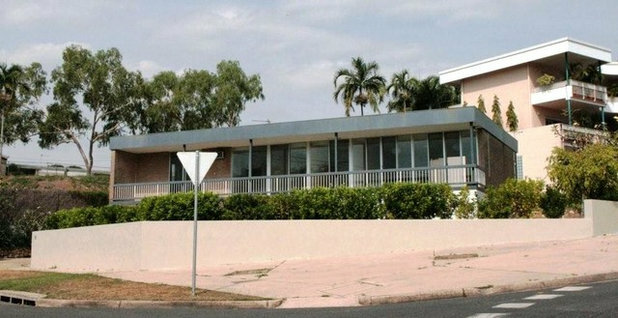 The original cream-brick facade had been rendered over with paint and sand, but Hindley wanted a fresh, clean look. 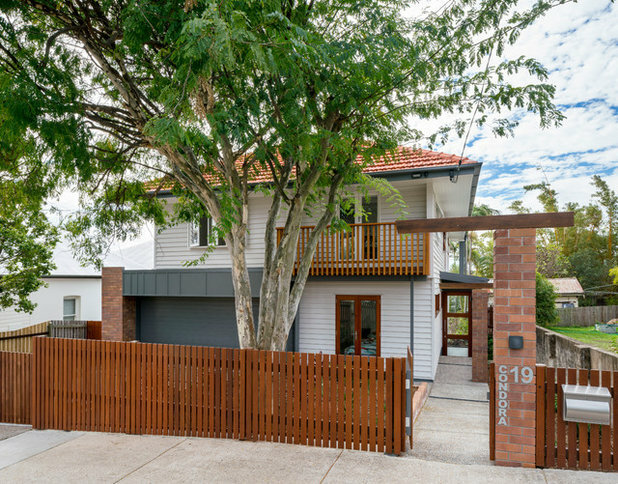 “Our builder smoothed off the render and painted the exterior white so the brick texture showed through, giving the house its crisp mid-century look,” she says. All involved in the project loved the existing full-height windows. These were upgraded with more energy-efficient versions, while windows with similar proportions were added to the newly built and enlarged spaces. “They are a product of more contemporary technology and 21st-century affluence, but reference and harmonise with the mid-century aesthetic,” says Hindley. 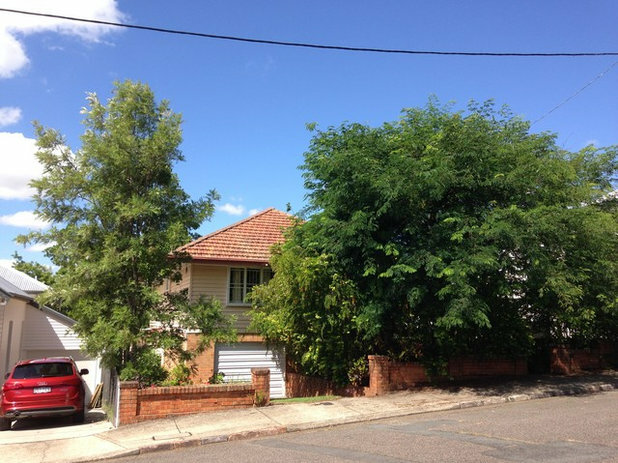 The pitched roof at the front continued the line of the original, with a carport and shed mimicking the profile. 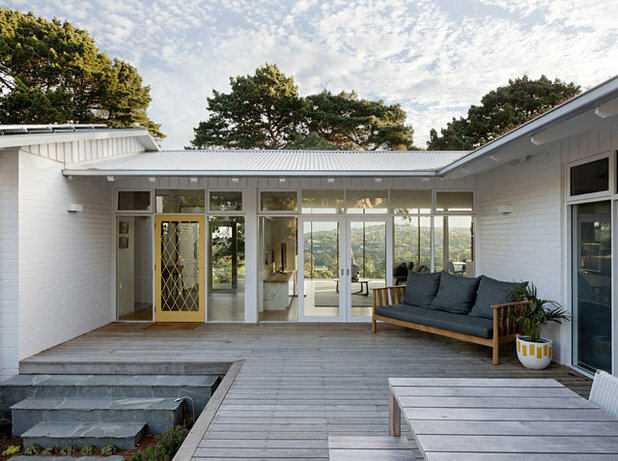 At the rear, a mono-pitched roof is also mid-century-inspired and provided the opportunity to raise the internal ceiling and install higher windows towards the view. 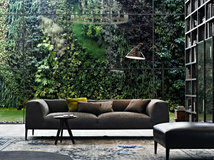 Tip: “Decide what things you most love about the house, and retain or amplify them. Everything else will follow from there,” Hindley says. 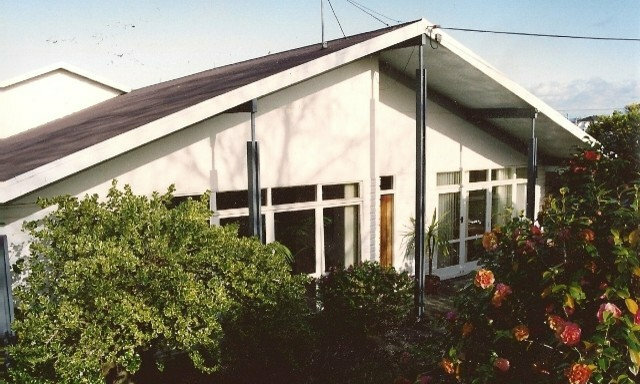 Architect Brad Muller of DM2 Architecture describes the original home (above) as a “true 1970s survivor, complete with brick end walls and a deep asbestos parapet”. 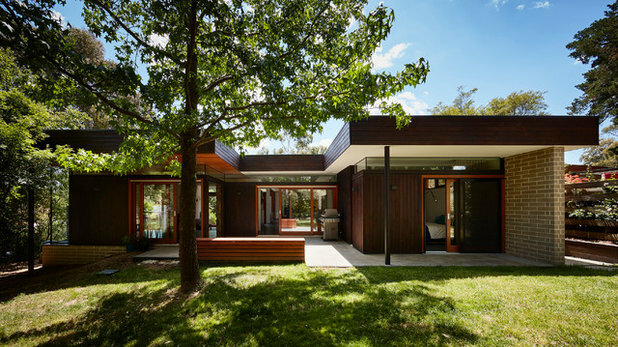 The owners were drawn to the form and aesthetic of the flat-roofed modernist box with its large expanse of glass, and sought to expand while building upon the essence of the original design. The addition of a second level mediates the neighbouring properties, which include larger buildings and more traditional residences. 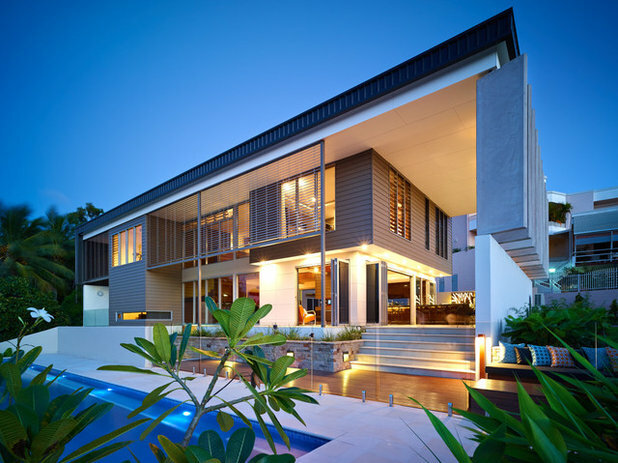 It is also designed to take advantage of the tropical climate, facilitating an indoor/outdoor lifestyle. “The scale and proportion were important and, as such, the building was more or less scaled up to meet the spatial requirements while maintaining the proportion of the original and providing a lineal appearance,” says Muller. 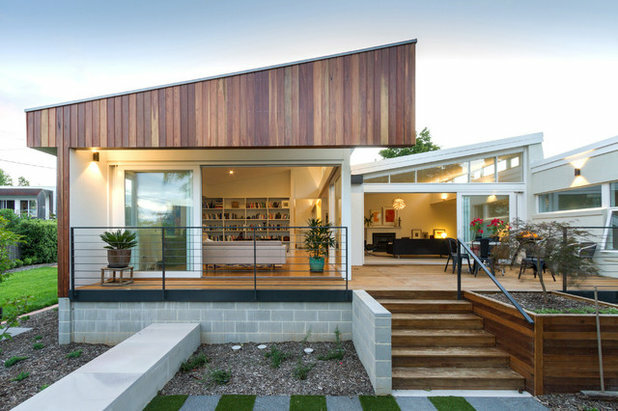 Mid-century modern architecture is known for its strong horizontal lines, which have been maintained here with the long flat roof that stretches beyond the facades of the house. The choice of materials and colours accentuates this appearance, as does the compartmentalisation of the building – “as per a Mondrian painting”, Muller says. The vertical elements here also have a strong linearity, with features such as sun-shading screens adding horizontality to their form. The large overhangs and deep reveals are functional features that provide protection and shading, while also continuing the mid-century aesthetic. 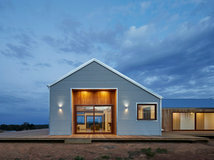 Materials are simple and honest; glass, weatherboard, stone and fibre cement. 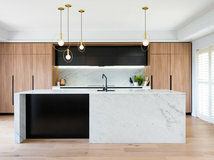 The house above was built in the 1950s and still in fairly good condition when the clients asked architect Allison Smith of Studio 15b to take it on. 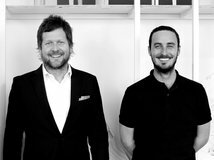 “Over the years the house was added to in an ad-hoc way, so it was definitely time for the building and facade to be stripped back and refreshed,” Smith says. The existing building had a material palette of brickwork, lightweight timber cladding and terracotta tiles – “all of which was ageing and due for an update,” the architect adds. 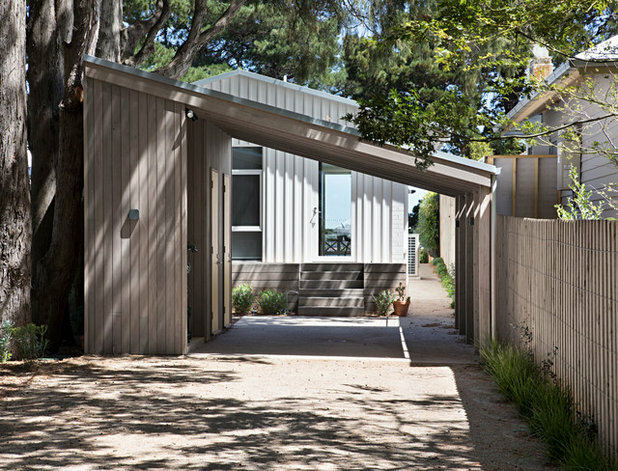 Smith’s approach was to re-orientate the spaces within the house and add some modern elements to the rear, while maintaining its traditional street frontage. 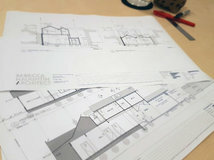 Raising the house allowed for the addition of a new double garage and laundry, as well as bedrooms, a kitchenette and an indoor-outdoor living space. A new coat of paint freshened up the facade and the colour scheme of grey and off-white kept the look simple and neutral. 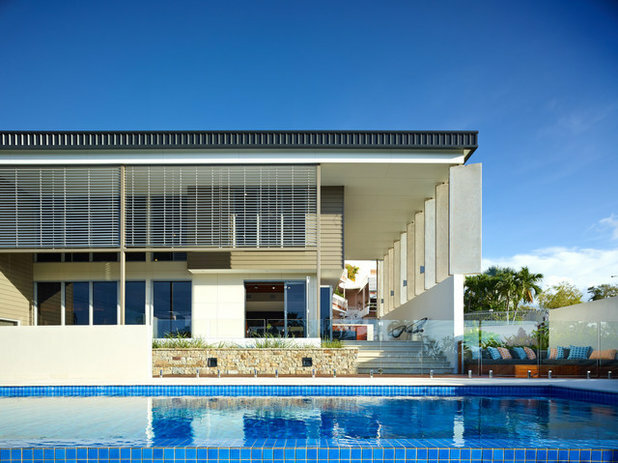 “The materials are modern and lightweight to tie in with the existing building, while adding new elements such as clear-finish timber [brings] warmth,” Smith explains. 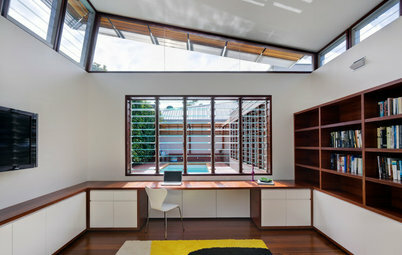 The addition of face brickwork is reminiscent of the original building, and complements the timber tones and textures. The pitched roof extension at the rear of the house is a sculptural M shape that blends seamlessly into the existing house. Tip: “Adding in something fun and experimental that blends in with the home’s original elements gives properties of this kind a modern look,” Smith says. 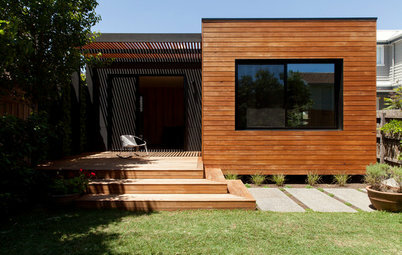 The renovation involved retaining and reconfiguring the original house while adding a subtle extension to the front and side. In upgrading and horizontally extruding the form of the existing building, Welsch was driven by sustainable design principles and aesthetic aspirations: “It acknowledges the suburban context and architectural vocabulary, while creating an ambiguity between the old and new”, he says. 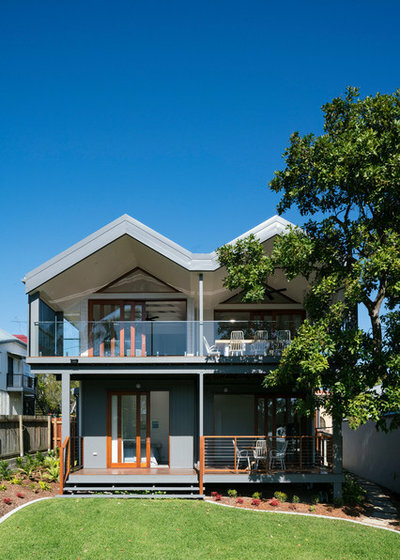 While the existing facade didn’t require structural changes, the roof and fascia were thickened to create a sense of solidity and warmth. This also allowed for insulation and for the installation of higher-quality timber doors and windows. Tip: “We find that most of these houses only need ‘tweaking’. The main problems are generally thermal comfort, the workability of kitchen and bathrooms, and storage. So, don’t overdo it; define what matters and focus on getting ‘the basics’ right,” Welsch says. 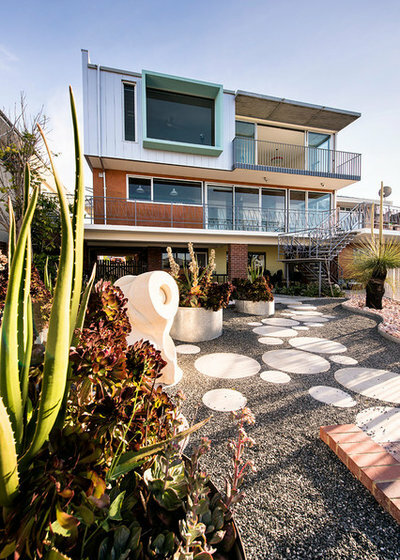 Davis House is home to architectural designer Colin Davis of Davista Architecture, and has undergone multiple alterations in its 90-year life. 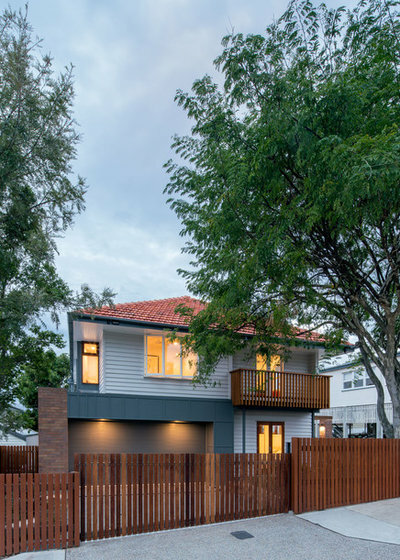 It began as a weatherboard bungalow in 1925 (and, in fact, still retains its original rimu floorboards), but its 1965 front and rear additions established its mid-century aesthetic. The property was renovated in 1988 and 1993, then extended in 2004 and 2016. 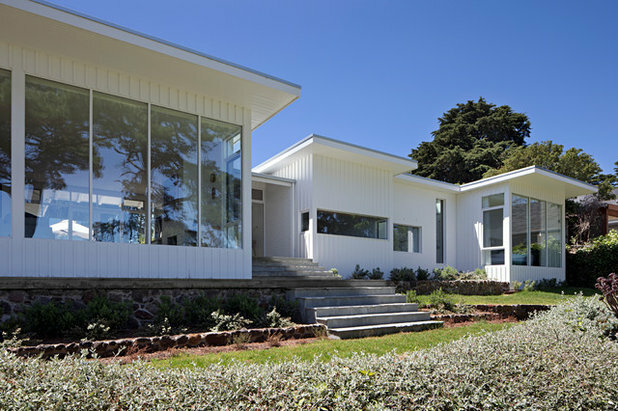 Keeping the mid-century pitched roof of the house, Davis has renovated the facade with columns and a close-gabled roof. The shingles are common to the style of both the original bungalow and mid-century aesthetic, and now bring a dose of Cape Cod-style to the house. Plaster columns and a carport have been added to one side, which create a rhythm of geometric shapes that are repeated through the house and garden. 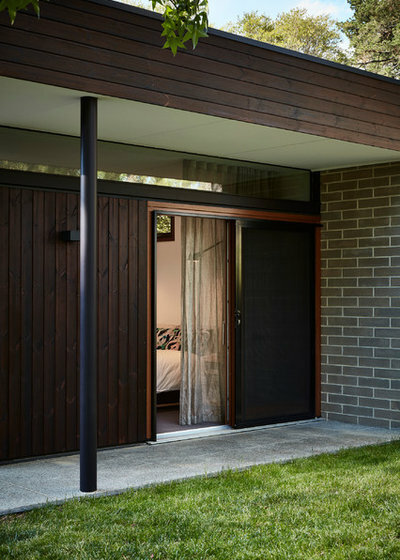 Matthews and Scavalli Architects added a second storey to this 1950s brick and glass home with an extension that is sympathetic to the original and the modernist era. 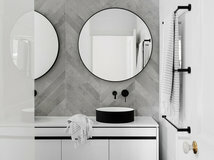 It takes its cues from architects such as Richard Neutra, Marcel Breuer and Pierre Koenig, with abstraction, simplicity and clarity of design. The box-like form has a strong sense of horizontality, and the large expanse of glass windows mimic the level below. 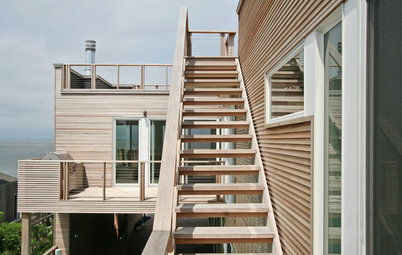 It has an extruded window frame, deep eaves over the balcony, and makes use of modern materials. 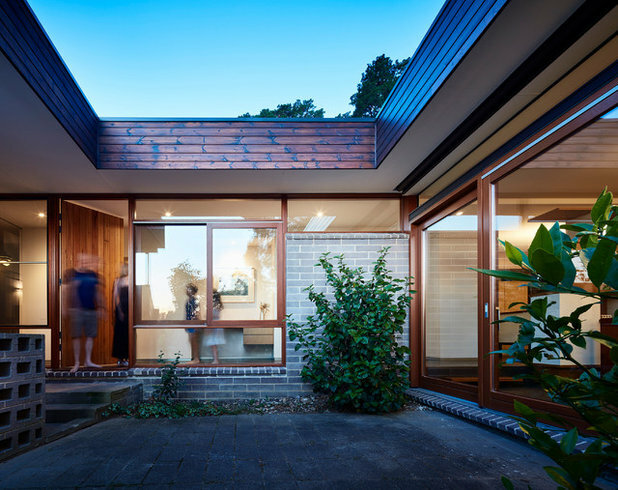 A new wing has been added by Ben Walker Architects to the rear of this 1950s split-level modernist home in place of the previous, poorly considered addition. The new wing is respectful of the form and character of the original, while introducing fresh new materials and detailing. The pitched roof line mimics the profile of the existing house, and allows northern light to stream in through clerestory windows. 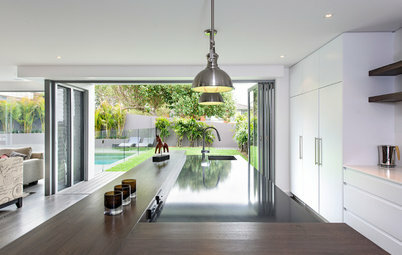 Sliding glass doors on the deck maintain a relaxed connection between indoors and out. 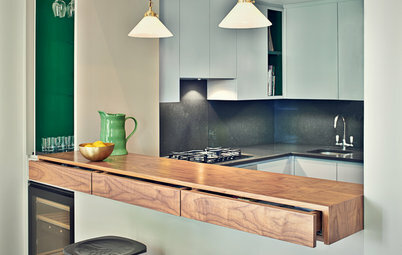 What’s your favourite feature in your 20th-century home? Or perhaps it’s more a case of the feature you loathe? Either way, we’d love to hear about it – tell us in the Comments below. 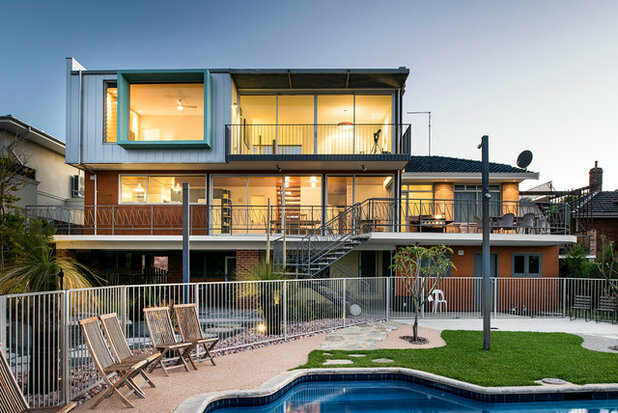 I would love to know whether the window/doors of the Newtown residence are aluminium or steel? Thankyou for including us in your article Rebecca. Alteration and addition projects inherently carry many challenges, and it's great to see a coherent final product suitable to both the original and new context! Well done all of these! There have been so many revamps recently that involve a big box extension stuck up on the back of the original cottage that these aesthetically sensitive reworks are a pure breath of fresh air.